Relax and unwind in peace, privacy and style! Experience affordable luxury accommodation in the only 4 1/2 Star AAA Rated & T-Qual Accredited Bed and Breakfast on the MV Coast ! Experience beautifully appointed spacious suites, super comfortable beds and full country breakfasts in a child-free haven, surrounded by beautiful landscaped gardens and natural bushland. Mescal's is a delightful sanctuary from bustling urban life and the perfect place for an overnight stay or a short break away. 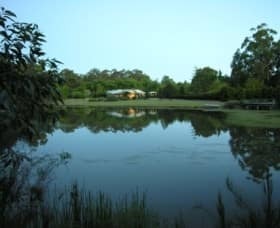 Suitable for honeymooners and retirees, family and friends, the business person or those travelling through the Manning Valley. Mescal's offers all the comforts of home catering for a maximum of 6 guests and is disabled / wheelchair friendly. ALL TARRIFS include full country breakfasts, morning/afternoon tea provisions and other treats. Evening meals are available by prior arrangement for guests not wanting to venture out at the end of the day. A choice of two styles of bed and breakfast accommodation are available at Mescal's. Choose from either the Wisteria (queen) and Magnolia (twin) Suites, with own bathroom en suites, kitchenette and lounge/dining area, internal and external accesses. a fully self-contained apartment, the Executive Spa Suite. Conveniently located five minutes from Taree Central Business District and ten minutes from the seaside havens of Old Bar Beach, Wallabi Point and Saltwater, Mescal's is the perfect base for your visit to the Manning area.